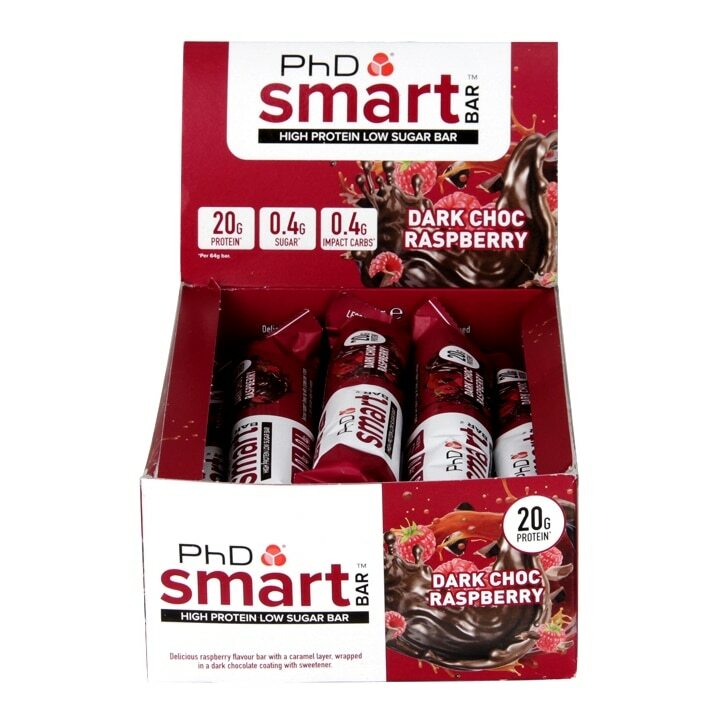 PhD Smart Bar Dark Chocolate & Raspberry is rated 5.0 out of 5 by 13. Rated 5 out of 5 by Penelope1008 from Great taste I brought a selection of protein bars as tasters trying to find one or two I could bulk order. This was one of them! Now I’m not a fan of raspberry flavoured items but thought I would give it a try! In fact it was one of the last ones I tried putting off what I expected to be for me a no won’t buy this again! I was wrong it was delicious I’ve ordered more of this and the others I enjoyed & am looking forward to my next treat. So often there’s an aftertaste that isn’t totally pleasant you didn’t get that with this bar so it will remain on my shopping list. Would love to see additional fruit flavours being offered such as strawberry & cherry if they could be as delicious as these ones. The dark chocolate is a great contrast & less sickly than the usual milk chocolate. Rated 5 out of 5 by GK_11 from My favourite protein bar I'm not a big fan of protein bars. I don't like their taste. But this one is quite a treat actually. Rated 5 out of 5 by JaqN from The Best! Started eating these to increase my protein levels..... The Best tasting protein bar I've tasted so far!! Great product!!! !